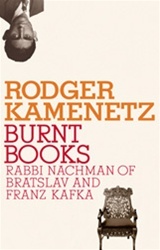 Rodger Kamenetz, acclaimed author of The Jew in the Lotus, has long been engaged in the study and practice of Jewish spirituality. And he has for many years taught a course in Prague on Franz Kafka. The more he learned about the life and work of Rabbi Nachman of Bratslav (great-grandson of the Ba’al Shem Tov, the founder of Hasidism), the more aware he became of unexpected connections between the lives and works of Kafka, a secular artist fascinated by Jewish mysticism, and Rabbi Nachman, a religious mystic who reached out to secular Jews. Both men died young of tuberculosis. Both invented new forms of storytelling that explore the search for meaning in an illogical, unjust world. Both gained prominence with the posthumous publication of their writing. And most intriguing of all, both left strict instructions that their unpublished writings were to be burned after they died. Kamenetz uses these episodes as points of departure on a journey into the spiritual quests of these two troubled and beloved figures. He concludes with an analysis of their major works that illuminates the remarkable similarities between them. In their attempts to understand the existence of a Supreme Being in an imperfect world, both men teach us a great deal about the role of imagination in the Jewish spiritual experience.